The third and almost final kind of cookie that I included in the goodie bags is one that seems almost perfect for the holidays. 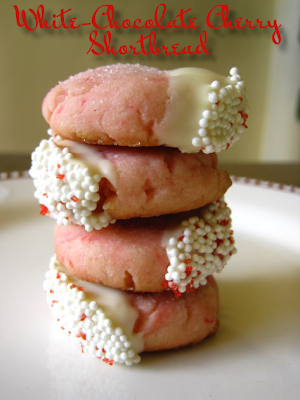 They're pink, dipped in white chocolate, and decorated with white nonpareils and red edible glitter/sugar. My mom said they looked like little Santa hats. These cookies from The Ultimate Cookie Book are very easy to make and decorate, and I'll definitely be making them again in the future. I'll probably even change the colors up a bit to adapt them to different holidays. I'll make sure to "give these cookies a colorful frill with a dip in melted white chocolate and a roll in nonpareils and edible glitter." 1) Preheat oven to 325F. Spread cherries on paper towels to drain well. 2) In a large mixing bowl stir together flour and sugar. Using a pastry blender, cut in the butter until mixture resembles fine crumbs. Stir in drained cherries and 4 ounces of the chopped white chocolate. Stir in almond extract and red food coloring. Form mixture into a ball and gently knead until smooth. 3) Shape dough into 3/4-inch balls. Place balls 2 inches apart on an ungreased cookie sheet. Using the bottom of a drinking glass dipped in sugar, flatten balls to 1 1/2-inch rounds. Bake for 10 to 12 minutes or until centers are set. Let stand for 1 minute on cookie sheet. Transfer cookies to a wire rack and let cool. 4) In a small saucepan heat and stir remaining 8 ounces white chocolate and the shortening over low heat until smooth. Dip half of each cookie into chocolate mixture, allowing excess to drip off. Roll dipped edge in nonpareils and/or edible glitter. Place cookies on waxed paper. Let stand until set. Hi Vincent, but I'm already registered on Petitchef.com. Thanks though!